Young piano virtuoso Luke swaps global stage for Wrexham chapel – Charity Concert | News by Wales Express News, People Before Profit! An internationally renowned young piano virtuoso is returning to his roots for a charity concert as a favour to his former primary school teacher. 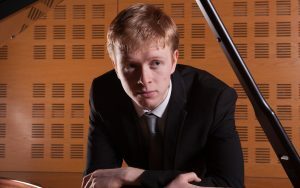 Luke Jones, 22, is celebrating after taking second prize at the world famous Maria Canals International Piano Competition in Barcelona and first prize at the Bromsgrove International Musicians Competition. But in the summer, Luke, a regular visitor to his family home near Wrexham, will be in the town for a charity concert organised by retired teacher Janet Lewis. The concert at Capel y Groes in Wrexham at 2pm on Friday, August 24, is raising money for causes close to Mrs Lewis’ heart – the town’s Nightingale Hospice and the Wrexham-based Brick Children School charity, which helps pay for the education of impoverished youngsters living in old brick kilns in Nepal. A former primary school deputy headteacher, Mrs Lewis, a trustee of the Brick Children School and a fundraiser for Nightingale Hospice, taught Luke when he was a young pupil at Ysgol Heulfan in his home village of Gwersyllt. She says this will be the fourth year the pianist has performed at the charity concert organised by her and husband Edgar, both members of Wrexham Yale Rotary Club. “He’s performed in the autumn in previous years, but this year it has to be in August because Luke is busy later in the year,” said Mrs Lewis. “I normally contact him, but this year he got in touch with me to volunteer his services. Numbered among admirers of his talents are Gareth Glyn, one of Wales’ best known and acclaimed composers. He says Luke played piano last year during rehearsals for the opera Wythnos yng Nghymru Fydd, which translates as A Week in the Future of Wales and was based on the iconic novel written by Islwyn Ffowc Elis. This has been a fruitful year for Luke. First he took the second prize of €10,000 at the competition in Barcelona and then he competed at the Bromsgrove International Musicians Competition and won the first prize of £6,000 donated by the Helen Rachael Mackaness Trust. The competition began with 200 applicants from 41 countries and was reduced to three for the grand final where contestants performed a piano concerto with orchestra in front of an audience of more than 2,000. That was quickly followed by his first place success at Bromsgrove. As well as the prize money, he gets the chance to perform a concerto with the prestigious Orchestra of the Swan, and a series of recitals with the Three Choirs Festival at the Bromsgrove Concerts and at the Birmingham Conservatoire. Luke began playing piano when he was five and was professionally coached, first in Birkenhead and later in Altrincham. He passed his grade 8 piano at the age of nine and gave his first public recital when only 10 at Wrexham Library. Then at the age of 11 he won a place at the world renowned Chetham’s School of Music in Manchester where he studied with head of piano, Murray McLachlan, until the age of 18. Recognising his talent, Gwersyllt Community Council awarded him a grant to enable him to study with Carlo Grante, one of the foremost concert pianists in Italy. He has been awarded several prizes in international competitions, notably first prize in the 20 and under category at the Rome International Piano Competition 2011 and first prize at the first Aci Bertoncelj International Piano Competition in Slovenia. He has performed recitals around the UK and across Europe. He has also performed on televised broadcasts in Wales, Italy and Slovenia. Luke also won the Blue Riband competition in the National Eisteddfod of Wales. He is currently studying at the Royal Northern College of Music in Manchester with Russian pianist Dina Parakhina. Naturally his parents, father Achille, mother Sharon and older brother Chris are extremely proud of his achievements as is his partner Imy, who is also an accomplished pianist who studies at the RNCM. The charity concert at Wrexham’s Capel y Groes for Nightingale Hospice and the Brick Children School is on Friday, August 24 at 2pm. Ticket details will be released later. Luke will also be giving an evening recital in October at Rhyl Music Club, one of the oldest music societies in the UK.